The trend towards applying economic value to forest ecosystems is contentious. While the valuing of the processes of nature (“ecosystem services”) or valuing of their stock value (“natural capital”) is potentially advantageous in helping to tackle challenges of nature’s conservation and protection, it is not unambiguously beneficial. I therefore wanted to find a way to visualise the sometimes contradictory nature of the ecosystem services approach, to convey the pros and cons, and to get away from binary arguments of being either “for” or “against”. 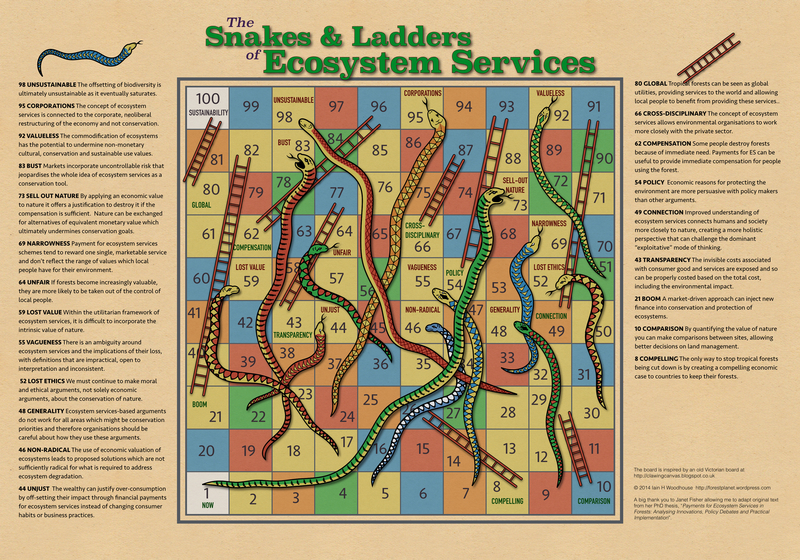 The Snakes and Ladders motif seemed appropriate. All those involved (well, almost all) share the same ultimate goal — a sustainable solution to preserving our remaining natural ecosystems (and that is sustainable both in biological and social terms). But an ecosystem services approach leads you on a path that is both advantageous and perilous. There are some clear “ladders” that offer us chances to move us forward, and “snakes” that risk undermining us in our journey and moving us away from our common goal. If you play the game with a die, you will find its all random. Luck rules. The question I am trying to pose by this graphic, though, is whether in real life we can have more control over our path — is it possible to navigate through these interweaved complexities and plan for success? Or will luck always shape our journey through the board? And surely an additional problem is that some people (a definite minority, but significant none the less) can profit from the snakes. It is certainly true that there are some players (e.g. the neo-liberal evangelists) who would have us play the game constantly, with no real interest in reaching “ecosystem sustainability”, simply because the more people there are going up and down ladders, the more profit they make. Play the game. Think it through. Comment with your own perspectives. There is a full resolution PDF version here, but note that it is >20Mb. An A3 printout is large enough to play on. If you download the image or the PDF, I hereby give you permission to copy and share it for non-commercial educational purposes (i.e. you can’t sell it in any form). If you’d like to do something commercial with it, or are just unsure if your usage is permitted, simply drop me an email.